With the wonderful weather we have been experiencing over the last few weeks, making the most of our gardens and outdoor spaces has become even more important when relaxing and entertaining at home. The patio becomes an outside room, an extension to your home. 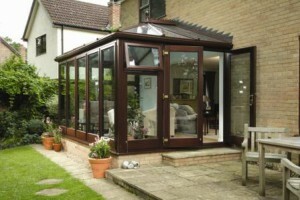 It gives you the opportunity to increase your seating area during the Summer period when it is nice to be able to sit outside and take advantage of the evening air; and when the temperature drops you can retreat in to the warmth of your conservatory and still enjoy the views of your garden. If you are thinking of extending, revamping or building a new patio area spend some time planning you project. 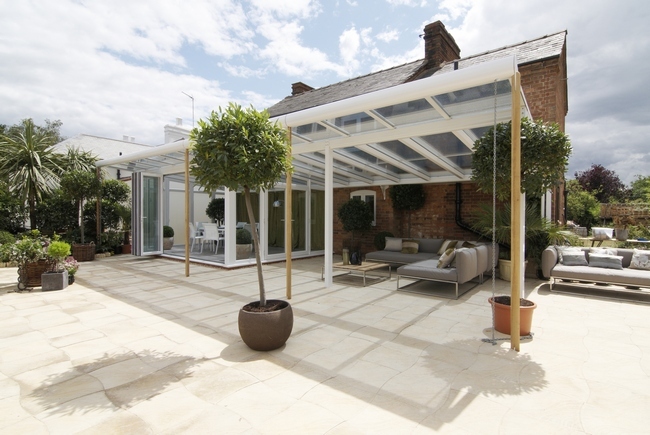 Patios can cost from a few hundred to a few thousand pounds, so always think about what you need to achieve from the area. Here are some suggestions you might like to consider, before digging up flower beds or ripping up the grass. The contemporary look of the Anglian Veranda Conservatory which compliments the large patio area. What do you want to use your patio for? – Will it be for eating and entertaining friends and family or just for you? – Are you using the area purely for relaxation? – Will it have a dual purpose? – How you will access the area, a flat path, steps or a gentle sloping ramp. – Do you have family or friends that have difficulty walking or need wheelchair access. – Does it need to be near the house or away from the house? – Does it need to be in or out of the sun at particular times in the day? – Is it to be a secret location, a hide away in the garden or open for everyone to see? What size should the patio be? – What is the minimum and maximum number of people you would like to be able to sit on the patio area? – Will it have tables and chairs standing on it at all times? – Will it need to stand additional items on it like fire pits, BBQ’s, sunbeds etc.? If you are unsure of the size you need, measure your current dining area, this will give you a rough idea of the area that you need. 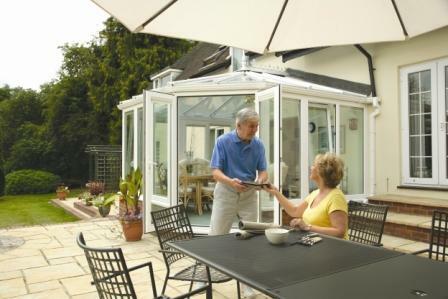 Remember if the patio is too big and it can look out of context in the garden, also if it is too small you will not be able to use it as you wish too. What style and shape of patio would you choose? – Square, rectangle, round, triangular or a mix of one style with curves? – Will it include a retaining wall on the edge of the patio? – Will it have integrated/raised flowerbeds? – Will it include a pond? – Wood or stone, paving slabs or gravel? What extras would you like to include in the area? – Set a budget and stick to it. Perhaps you maybe able to have a contingency fund for that unexpected overspend. – Will you need to employ professionals to lay the patio for you or will you be able to do the work yourself?